Your host, putting his money where his rhetoric is: getting a TDaP booster. Let me be clear right off the bat: Vaccines don’t cause autism. It’s really that simple. We know they don’t. There have been extensive studies comparing groups of children who have been vaccinated with, say, the measles, mumps, and rubella (MMR) vaccine versus those who have not, and it’s very clear that there is no elevated rate of autism in the vaccinated children. This simple truth is denied vigorously and vociferously by antivaxxers (those who oppose, usually rabidly, the use of vaccinations that prevent diseases), but they may as well deny the Earth is round and the sky is blue. It’s rock solid fact. They try to blame mercury in vaccines, but we know that mercury has nothing to do with autism; when thimerosal (a mercury compound) was removed from vaccines there was absolutely no change in the increase in autism rates. I could go on and on. Virtually every claim made by antivaxxers is wrong. And this is a critically important issue; vaccines have literally saved hundreds of millions of lives. They save infants from potentially fatal but preventable diseases like pertussis and the flu. So why did Congress hold hearings this week promoting crackpot antivax views? I’m not exaggerating. The Committee on Oversight and Government Reform held a hearing trying to look into the cause and prevention of autism. Rep. Dan Burton (R-Ind.) launched into a several-minute diatribe (beginning at 12:58 in the video above) that starts off in an Orwellian statement: He claims he’s not antivax. Then he launches into a five-minute speech that promotes long-debunked and clearly incorrect antivax claims, targeting mercury for the most part. Burton has long been an advocate for quackery; for at least a decade he has used Congressional situations like this to promote antiscience. In the latest hearing, Burton sounds like a crackpot conspiracy theorist, to be honest, saying he knows—better than thousands of scientists who have spent their careers investigating these topics—that thimerosal causes neurological disorders (including autism). He goes on for some time about mercury (as does Rep. Dennis Kucinich (D-Ohio) starting at 21:44 in the video), making it clear he doesn’t have a clue what he’s talking about. For example, very few vaccines still use mercury, and the ones that do use it in tiny amounts and in a form that does not accumulate in the body. Talking about the danger of mercury in vaccines is like talking about the danger of having hydrogen—an explosive element!—in water. It’s nonsense. I won’t go further into details, because this shameful travesty of truth and medical health goes on for an hour. On Forbes.com, Steven Salzberg wrote a fantastic article about this Congressional farce. I strongly urge you to read it, since Salzberg brings the hammer down on the Congresscritters who think they know more about science than the scientists who actually devote their lives to this topic. If you get the sense I’m angry, you’re damn right I am. Vaccine save lives, and antivaxxers put those lives in grave danger. These lives include people who are immunocompromised (people on immunosuppressants, for example, recovering from cancer or who have autoimmune diseases like rheumatoid arthritis). It also includes infants too young to get vaccinated, who rely on the rest of us getting our shots to increase herd immunity, reducing reservoirs for the infectious diseases to live. And if you don’t think this has an impact, I urge you—if your heart can stand it—to read the story of Dana McCaffery, a perfect little girl who, at the age of four weeks—four weeks—died of pertussis, a disease she was too young to be vaccinated against and that she might never have contracted if it weren’t for low immunization rates where she lived. Pertussis. Whooping cough. A disease that for years has been on the decline but has come roaring back—along with measles and other preventable diseases—because people aren’t getting vaccinated in high-enough numbers. I am a parent myself, with a fully-vaccinated daughter, I’ll add, and it breaks my heart when I think of what Dana’s parents, Toni and David McCaffery, went through. 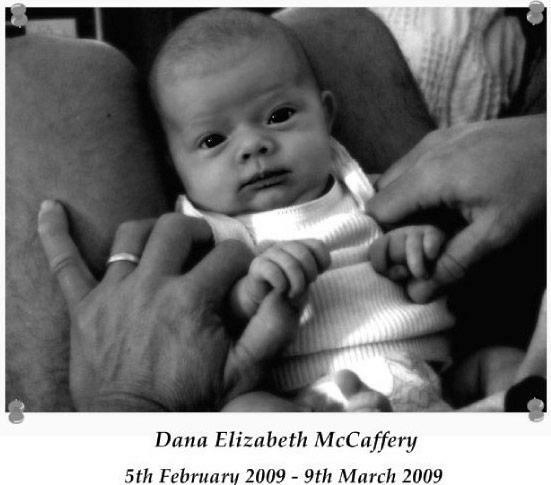 Dana McCaffery, February 5, 2009 - March 9, 2009. So yes, I am angry. And to see members of Congress repeat the provably wrong and immensely dangerous rhetoric that vaccines cause autism makes my blood boil. Don’t listen to self-proclaimed experts like Kucinich and Burton who throw out years of painstaking science and replace it with conspiracy theories and gut feelings. Instead, listen to your board-certified doctor. 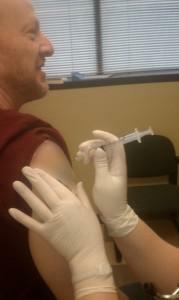 If he or she recommends you get vaccinated, do it. The life you save may be your own, or it may be that of a newborn infant living down the street from you. And please, write your representative about this. Make a difference. Happily, Burton is not running for re-election, but it’s clear there are others willing to take up his mantle. Science saves lives, just as most certainly antiscience can take them away. Tip o’ the protein capsid to D.J. Grothe on Twitter.